Germaine grew up on the gorgeous island of Curaçao where it was all about family. She has a very large family and family outings or family days were and still are common in her life. She, her mom, sisters and cousins would always get together to celebrate whatever there was to celebrate in their lives. The beach was a big part of these celebrations. She only had a handful of friends growing up but the friends she had then are still her friends today and they helped shape her into the woman she is today. She moved to Pittsburg at the young age of 16 where she did her undergraduate in communications and economics. After that she went to the university of South Florida where she did her MBA specializing in marketing, finance and international business. She initially wanted to do Public Relations but decided to take a broader aspect of it and do communications instead. Her bachelor was in communications with a minor in economics and she graduated with a masters in international business at age 22. Germaine had her life after graduation all lined up. She was approached by a prestigious accounting firm in Curaçao as well as by the representatives of the Miss Curaçao organization to participate in the upcoming beauty pageant. She accepted both offers and was actually excited about it all. But fate intervened and Germaine unexpectedly landed a job with power company Eckerd Corporation just 3 months shy of her finishing grad school. The job came with green card sponsorship. Thirty days into her new job Germaine met Mr. Jeffrey Joyner, the VP of Eckerd at the time who quickly became her mentor. She has a deep respect for this man who is not only an incredible inspirational and key note speaker but also taught her much of what she knows today and was the one to give her her first career break. Mr. Joyner was starting a new department called the Brand Development Department and needed a brand developer manager for this department. Germaine proved to be the best person for this challenge. The above is one of Germaine’s favorite quotes. What she didn’t know is that this quote did not come from Oprah like she initially thought but rather by none other than her mentor Mr. Joyner who just happened to play tennis with non other than Dr. Phil on occasion. Germaine still considers Eckerd to be one of the most exciting jobs she has done to date. She has developed an entire product line for this company, she was part of a team that did a lot revolutionary things within the company and her department was one of the highest profit margin departments within Eckerd. In total, Germaine gave Eckerd a good 7 years. She climbed quite fast within the company and ultimately ended up with the title of Category Manager for the Beauty Department, where she managed millions of dollars and was in charge of skin care and nail department purchases and decisions for lines that Eckerd was going to carry. It was a very analytical position that was all about the numbers. She was 24 when she became category manager, by far the youngest person to ever have this position. In her 6th year with the company rumors started going around that JC Penney was going to sell Eckerd. Germaine saw this as the perfect opportunity to start realizing her life long dream of opening a Spa and Wellness Center. AWA Spa was born that same year and the last 6 months of her career at Eckerd were spent working 12 hour days while she juggled her regular tasks at Eckerd during office hours and managed the spa in the evenings and weekends. Her dream of one day owning her own spa started when she wrote a business plan for a fictional spa during her MBA. She alway kept that business plan, tweaking it as the years passed by. During her days at Eckerd Germaine started taking skin care courses. After all, if she wanted to have a great spa she needed to know what it was like to give treatments as well. AWA Spa was awarded best Spa in South Tampa. During her Eckerd years Germaine was approached by a modeling agency recruiter. After her first photo shoot she was introduced to the agency and hired on the spot. For a while she did modeling gigs whenever she could, in weekends, outside of regular office hours or if the gig was big enough she would take vacation days. She was a professional model for about 10 years. What you need to understand about GG is that she was always a bookworm at school, very focused on school and career and the person one would least expect to be interested in modeling. But because of that she felt she had to prove to the world that beauty pageants much like the Miss Curaçao pageant she turned down a few years earlier, as well as her modeling career, was not only for certain types of girls. She sought and wanted to be more than what was reflected externally. Her drive lead her to become one of the few models with a Masters degree, full-time corporate career as well as her own business. Going back to right after that initial interview with Eckerd, Germaine was on a high and was feeling really good about herself. She had a lot to smile about. Here she was, 22 years old and just landed a promising job. She decided to stop at a pet store she saw on the way. On a whim she went inside, seeking for more to brighten an already quite bright day. What better way than starring at cuddly puppies and kittens? She had no desire to adopt or buy a pet that day but it was love at first sniff when a little ball of Paperanian fur was put in her arms. Buddha went home with her that day and the pair was inseparable for 15 unforgettable years. Budha passed away two years ago and is now buried under a Bodhi tree. Germaine’s dream home was built around this tree. The Bodhi tree happens to be the actual tree where the real Buddha achieved enlightenment. Germaine along with her boyfriend Patrick recently became proud pet parents of Coco and Bodhi. Two very sweet yet very mischievous fur balls. Bodi and Coco are like Yin and Yang, complete opposites in personality but together they form the perfect balance. After having the spa for almost 10 years she was at a point where she was ready to go back home. She had done all that she could do with the spa, her modeling career was still ongoing but almost peaking, her marriage of 8 years had ended by that time. She was ready for a change. A company in Curaçao approached her and painted a very promising career opportunity. It was also around this time that she met and fell in love with her now boyfriend Patrick, who happened to have attended the same high school without either of them once meeting each other before. The decision was easy. She sold the spa, quit her full time job as VP of Sales for a biomedical company, quit modeling, packed her things and she and Buddha stepped on a plane never to look back. The job in Curaçao was not what she expected and she left after two years to take the position of VP of Procurement and Marketing at A&W, a company she had worked with during her Eckerd years. The job demanded that she be in contact with the head office in New York City and the factories in Asia at all time. With the time difference this meant an almost 24/7 job. So Germaine left and immediately landed a new job for a company that has been after her for a few years. She is now the VP of Marketing and Business Development at IBIS Management, a position that was created just for her. After less than a year with this company Germaine truly feels that this will be the company she will retire with. The owners of the company have a great sense of team work, are incredibly forward thinking and passionate about what they do. Something that you may have never known about Germaine and that might surprise you is that she is a Reiki Master and a holistic sound healer. She is an avid yoga practitioner and meditates daily. She sought meditation to achieve peace and balance since she was always an overachiever and always on the go, always wanting to reach higher and higher. During her visit to China for Eckerd she visited temples and did some meditation and joined in Tai Chi. Her visit to Ubud, Bali was a memorable one. She went not only for vacation but also to learn from a Tibetan Sound Healer. Just before her move back to Curaçao Germaine went on a month long trip to India where she did some healing at an Ayurvadic Resort, explored a tea plantation and participated in an Ashram, a kind of a cooperative community with a temple, a guru and lots of meditation and yoga. Especially Sadhguru made a real impression on her. *Ayurvadic = holistic healing system. It is based on the belief that health and wellness depend on a delicate balance between the mind, body, and spirit. The Inner Engeneering Retreat at the Ashram in India. Germaine is second from right on the bottom row. Germaine traveled to many great destinations and it is hard to pick just one favorite because each destination served its own purpose. Still she counts Ubud, Bali as one of her favorites just for the spiritual aspect and because she is so Yin and Yang she also picks New York as an all time favorite destination. Building her dream house on a plot of land in what has always been her favorite location. Germiane’s dream house. In the front is the Bodhi tree, Buddha’s last resting place. She used to be one to run away from stress. But learned to take really deep breaths, focus on a solution, not take things personally and accept everyone for who they are. Never underestimate yourself. caribbean women are a lot more diverse and versatile and educated than outsiders expect. Germaine is proof that having it all is possible with a little thing called determination. Today she is on the board of Curaçao Cares, an organization that encourages corporate social responsibility. This same organization carries the Cura Doet event once a year. She is also on the Curaçao Tourism Board and that of Selikor. 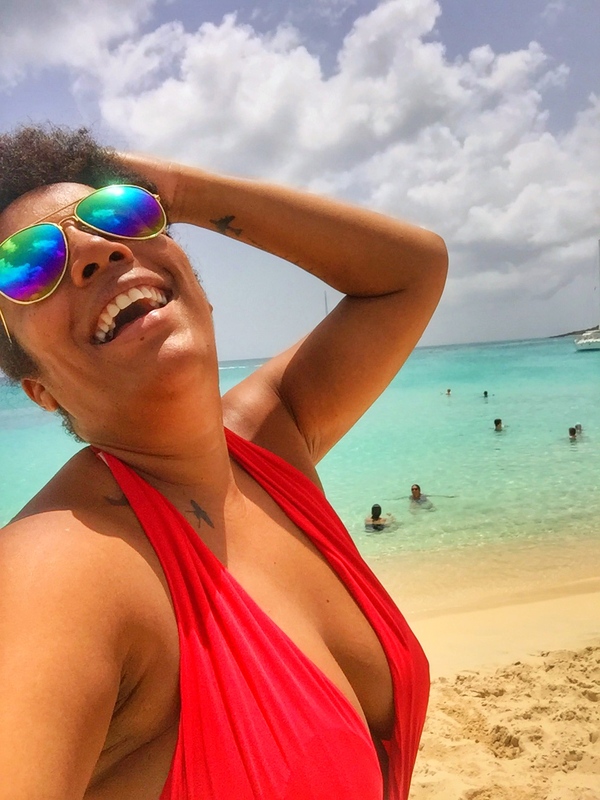 She currently holds the position of VP Business Development and Marketing at IBIS Management Associates, which has been named most innovative company in Curaçao. She is pet mom to Coco and Bodhi, girlfriend to Patrick, she now and then hosts beauty pageants and still models when the project is of particular interest to her. She is a Reiki Master and a Sound Healer, an avid yoga practitioner and she meditates often and does a littleTai Chi whenever she can. On off days you can find her outdoors either paddle boarding, on an early morning bike ride or involved in an activity with family and friends, Bodhi and Coco always in tow. This is the life of Germaine, a truly remarkable island gem. Early morning bike ride followed by a quick dip in the ocean. Are you TTIG’s next Island Girl of the month or do you know someone whose story should be told? Contact me today. Let’s get her story heard. Love this. When I wrote for another website (not mine), I did a couple of different types of interview pieces and this was a great reminder that I loved doing them. I got to see and learn about how other people live! Now that I don’t write fro that site anymore, I should bring that to DTWB. much love, island girl!